You know those times when you randomly cross paths with someone and form an instant kinship? I’m always amazed by those events. I don’t know why I continue to be amazed by them because they happen so often, especially when I’m watching and waiting for them. But when they happen, I think it’s still the coolest thing on the planet. Coincidence? The Universe doing it’s thing? Karma? I don’t know what it is, what to call it, how it happens, or why it happens–I just know it’s really freakin’ cool! Things with SparkPress continue to progress toward the September pub date for Echoes of War. Right now the manuscript is being proofed. The person doing the proofing emailed me early in the week with a question for me on a proposed edit she wanted to make. The proposed edit made perfect sense, so I told her to go ahead with it. That was the start of an email chain we’ve now had going back and forth about a myriad of topics. Like me, she is a bibliophile and traveler with a tendency to land in Europe, so we’ve have plenty to chat about. She also had a history of working in IT and now enjoys her retirement getting paid to read books and integrating in some travel time. 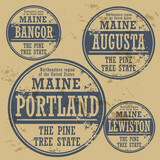 Here’s the best part: she’s a Mainer (pronounced Main-ah). Not a transplant like me, but a legit Mainer. Born there, grew up there, moved away, came back, and stayed. At times I get mired in the tedium of writing novels. Editing makes me sometimes feel like my eyes are bleeding while my brain slides out one or both of my ears. While bleeding-eyeball deep in editing the last few weeks on another project, this week’s email exchanges have uplifted me in a way that had me charging full speed last night with editing only to get up early before the bill-paying job started to edit some more. I can’t say I would’ve been able to do that without the unexpected boost from crossing paths with a kindred spirit. Look for those opportunities to connect with others. They’re just waiting for you to scoop them up! Is It Wrong To Be So Giddy?